Earlier this year The Event Cinema Association (ECA) published its “Technical Delivery Handbook”, a step-by-step guide to live delivery of event cinema, written by ECA members for the benefit of the industry. With satellite delivery the preferred mode of delivering live opera, theatre, concerts and more to cinemas this is arguably the most critical component of streaming events to big screens around the world. CJ is in partnership with the ECA exclusively serialising three parts from the Handbook’s ‘Live Delivery Via Satellite’ section. The full book can be ordered HERE. We highly recommend it for anyone interested in or working in the cinema and event cinema field. The sets of standards presented below are those customarily used in the industry. However it is worth noting that they are not the only standards available. The Outside Broadcast Audiovisual Production (OB A/V) will require that both the main video feed and emergency video feed coming from the OB production truck are HD-SDI in 1080PsF25 (also referred to as 1080i-50i). The feed video (HD) and audio (AC3) must be embedded. The main audio feed from the OB production may be Dolby Digital AC3 5.1 pair ½ and a backup AES/PCM Stereo pair ¾. The audio must be embedded in the HD-SDI signal provided to the uplink truck. The image and the sound must be sent in sync by the OB to the uplink truck. No delay is applied in the uplink truck. The AC3 signal must never be interrupted in order to avoid problems with the stream solution in the cinemas. For the OB Encoder Sensio 3D integration, shooting will require the video format 1080-25fps or 1080i-50i, a 2 HD-SDI connection, and the screen reference size “Cinema”. 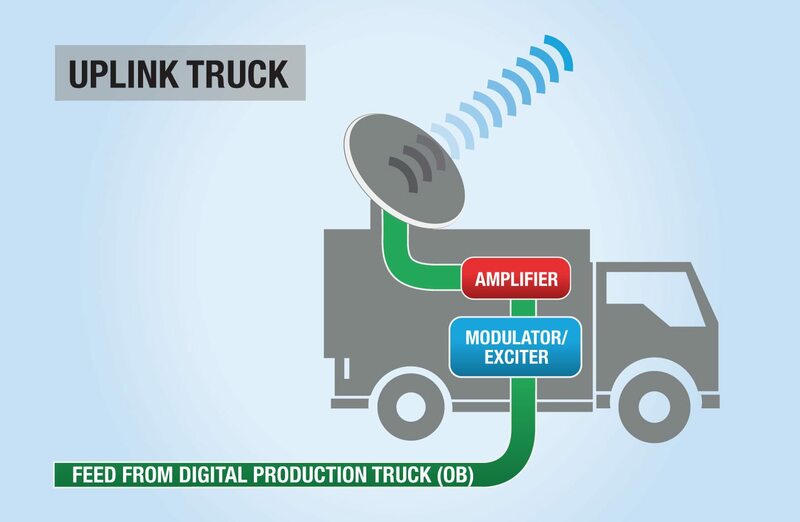 For the OB – the uplink truck interconnections, the requirements will be an embedded video and audio by the OB production to the uplink truck. The uplink truck must provide the HD-SDI cabling between the OB production and the uplink truck. If the cable needs to be 80 meters (262 ft.) or less, a coaxial RG6 cable is acceptable. If the cable needs to be longer than 80 meters (262 ft.), a fibre optic cable is mandatory. NB: 80 meters is normally safe but the HDSDI links may be able to go to between 100 and 130 meters depending on the equipment manufacturer and the cable routing. It is important to know that poorly routed cable with sharp bends or crushed by ramps, doorframes etc…will only work over shorter distances. During the Event, the technical SAT Support monitors the signal and helps the exhibition venues to setup the system for the reception. The technical SAT Support is also a relay with the technical partners managing the Event. Turnaround: The turnaround is a re-direction of the satellite signal managed from a teleport that catch the signal from the uplink truck and retransmit to one or more different satellites. The video encoding: The image transmission is usually encoded in MPEG2 in the uplink truck. MPEG4 can be an alternative. 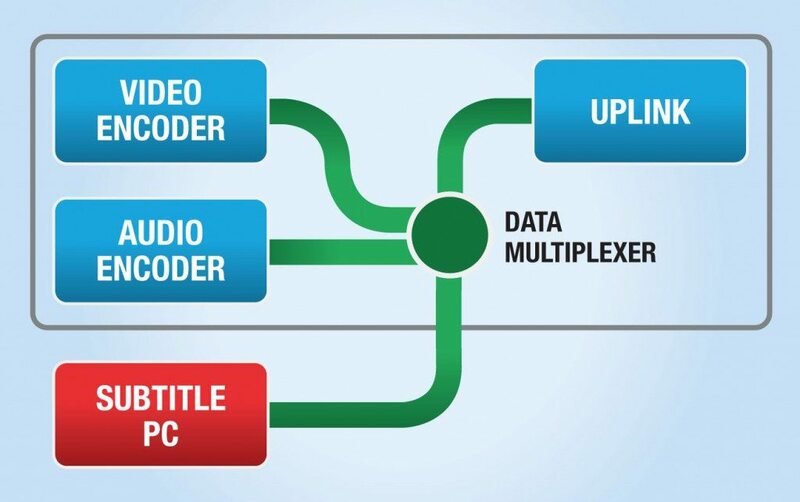 Professional decoders like IDC manage both MPEG2 and MPEG4, while consumer receivers may not all manage an MPEG4 format. MPEG-2 (H262) encoding must be in frame base only. The live feed to the cinema is in 1080i50i. A satellite dish must be installed taking into account the signal to be received, the satellite footprint and the cinema’s budget. Dish size will depend on the territory and strength of signal to be received from the satellite and may vary from 1.2m diameter (3 ft. 11 inches minimum) to 1.5m (4 ft. 11 inches) in diameter. Cinemas may sometimes install a dual feed dish as some satellite companies use 2 different satellites. The installation of the dish and its maintenance must be carried out particularly carefully to prevent the dish from moving in stronger winds thus causing a potential loss of signal during a live relay. Professional receivers like IDC manage MPEG2/MPEG4 formats, live 3D, embedded subtitles, encryption (BISS) and live 4K 60P in HEVC format. Consumer receivers may manage some features but rarely (if ever) all of them. This is one of the main causes of performance failure during a live event. Another advantage of professional receivers is that they can be remotely managed by a NOC or a support team. In contrast, consumer receivers generally do not have hotlines so when faced with an issue, the cinema staff will have to fix issues themselves. An HD-SDI cabling: one cable per auditorium from the receiver to the projector: reliable and easy, but this is a costly solution. A Doremi StreamIt: only works with Doremi servers and up to 5 maximum, manage embedded subtitles, and only Sensio 3D. Frame based MPEG2 only. There are other solutions such as having one receiver per auditorium but this could prove very expensive. Subtitles can be either burnt into the picture or provided as embedded. Burnt-in subtitles: If the subtitles are burnt into the picture, the content provider or distributor will have to provide one satellite signal per language. This solution becomes very expensive when several languages have to be provided over several satellites. Embedded subtitles: A more cost-effective solution is to provide a clean image feed with embedded subtitles which can be selected via the PID on the satellite receiver. As of today, a maximum of 8 subtitles can be managed at once in SD and HD form. Professional IRD like IDC are able to receive a protected live feed compliant with BISS, the industry standard for live cinema broadcasting. This ensures the widest compatibility with the major satellite encoders on the market. 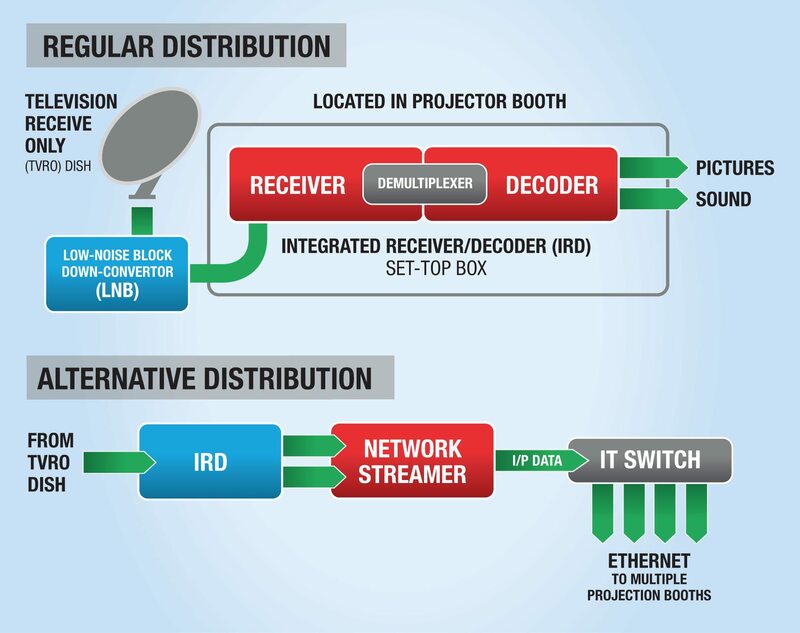 In particular, IDC receivers can supports BISS mode 0 and mode 1. To ensure a higher security level, the BISS key can be modified at any time before and during the event remotely only by the NOC. This machine-to-machine operation ensures that no one can read the password once it is set. Encryption facilities are available from all the uplink facilities as it is already widely used for TV broadcasting particularly sports (e.g. uplink from soccer stadium of a football match). Fabrice Testa has an MSc in Engineering and an MBA from Brussels Solvay Business School. He joined XDC in 2005 and contributed to positioning XDC as one of the key players in the digital cinema industry in Europe. Fabrice was Vice President and member of the Executive Committee, leading many business development projects. In December 2012, he left dcinex (the new name for XDC) to become CEO of DSAT Cinema, joint-venture between Eutelsat and dcinex. With over 1,300 contracted cinemas, DSAT Cinema is the European digital delivery open network offering a universal satellite solution for live broadcast and feature DCP delivery to cinemas.